Damaris & Marc introduced the EIGG library for the first time at Maison&Objet'08 , inspired in "Cradle to Cradle" criteria and also inspired in their design research in micro-architectural furniture. 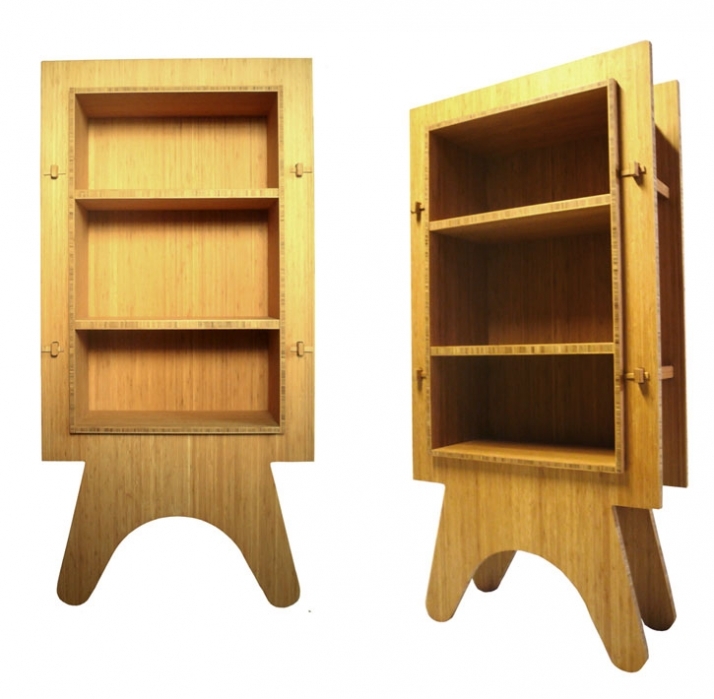 Micro-architecture as a volume and as in constructive methods, such as the assembly, frequently used by carpenters in Japanese traditional wooden houses. EIGG summarizes the studio's philosophy: flat-pack, made of bamboo, a highly renewable material and with environmentally respectful pastes and polishes. This design had been required by the EIG enterprise a consultant on sustainability. Working with their biology and chemistry experts to make the best material choice a fact, according to sustainability. 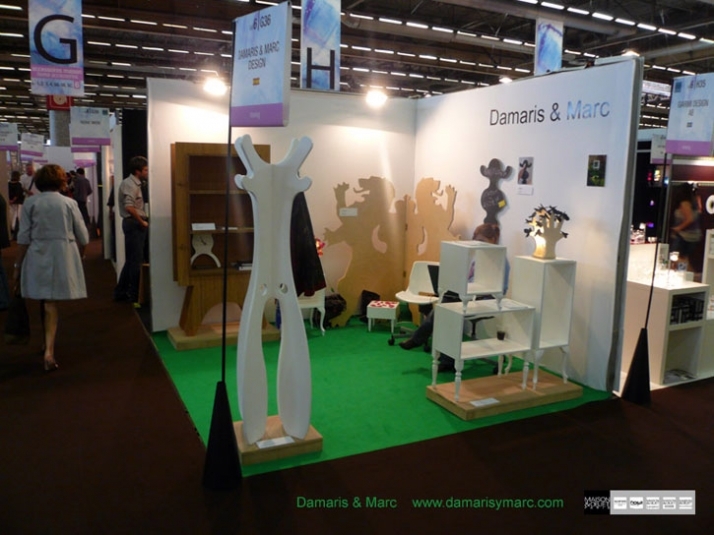 This library is the first piece of the following collection of Damaris&Marc which will see light in 2009. Marc: Creative, daydreaming, meticulous, thoughtful and hungry I am always very hungry. Damaris: Dreamer, idealist, obstinate, committed, sleeper. Damaris: I have two specials: "Mononoke Hime", "Mon Oncle"
Marc: Any music played with the heart. Any song that makes your feelings sing. Damaris: All kind of music depending of the situation and the weather. What is your favourite design material? Damaris: I think I don't have enough experience to choose just one material as I would like to try with hundred, thousands of them. But ones that are attracting me a lot lately are recycled plastic, clay and ceramic. Marc: Love, Kindness. There is a universal language that all beings use when they have the chance to be close to their purest nature. The result of this behavior applied to any subject becomes inspiration itself. Damaris: Every thing, my every day life. Damaris: To a huge cottage in the forest with a lac near by to go for walks. I would invite: Einstein, the Dalai Lama, Estella McCartney, Sting, Mother Teresa, Jean Prouve, the Eames couple, Bjork. Marc: Yes, the unknown is certainly frightening but at the same time it contains all the answers. Damaris: I try not to, and if some time a little though come to my mind with "be carefull, be prudent, what is going to happen if..blablabla..." I remember myself when two years ago Marc had a cancer and life was every day when we waked up. No more than that. Marc: The day in which someone decides to change deeply inside. What does space mean to you? Marc: It is the description of an object's presence. Is the place occupied by something that does not exist. Damaris: ...wow! What a question...space, for me value of space depends of what is in or what is not. Of your own design work, what project are you most proud of? Marc: Our latest piece "Eigg" library. Marc: The abundance of unnecessary things. Damaris: When you have enough to live, you and you family, then enough to give to those who needs it, and then you can spend for your "luxury". Marc: To create shape, function, beauty and happiness. Damaris: a 3d way to interpret life.